Grateful to be raised in a home filled with lots of love, and siblings. I have enjoyed 25+ years of property management experience and in the past 10 years being a Realtor seems to go hand in hand. 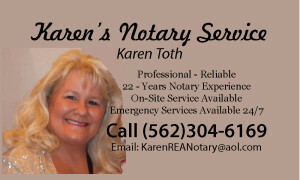 Serving for over 22 years as a Notary Public, with background in the legal field all things seem to fit well together. With all I do, I thank God, give back to the community and always do my best to do what is right. This entry was posted in Notary Public on March 10, 2015 by KSToth. Colossians 3:23 Whatever you do, do your work heartily, as for the Lord rather than for men, 24 knowing that from the Lord you will receive the reward of the inheritance. It is the Lord Christ whom you serve. This entry was posted in Uncategorized on September 18, 2014 by KSToth.